JV2 is an extraordinary ensemble of muscular talent. Poised and delightful to watch, they embodied a triple bill of works by AΦE, Vinicius Salles and Jasmin Vardimon on Friday night at the Lillian Baylis Studio of Sadler’s Wells, where audiences were put through a multitude of emotional states. JV2 comprises of artistic director’s Jasmin Vardimon’s own hand-picked choice of 16 young, international performers from various backgrounds, including England, France, Greece, Scotland and as far out as Canada. Esteban Fourmi and Aoi Nakamura, founders of AΦE, produced the piece, Wound which encapsulates a disturbing, haunting yet enlightening vision of current events in Europe and the Middle East. Abstract in form, JV2 created lines and shapes out of light in complete darkness and gave an outline of asylum seekers moving backwards and forwards as they flee their country to escape war. Another political idea was described by JV2‘s Sydney Robertson who concealed his face behind a black mask. Dressed in a scarlet Victorian-esqe dress and blonde wig, he asked the audience to stand up to his female character’s affirmation on power, belonging and social acceptance. He gave a beautiful and sweeping performance immediately after. Carried onto stage like a fragile child was Daniel Brown whose semi-contortionist body and ability to pull his stretchy skin caused some audience members to cover their eyes. The experience left a huge impression on me, providing unforgettable imagery by JV2‘s unbeatable talent. Vinicius Salles’s piece, Human Marvels begins with introducing biological rarities and ‘freaks of nature’ as if they were part of a nomadic circus group, which moves fast into a club-like, techno-music environment. JV2 are ravishing and hypnotic here. Their dynamism shines as they encompass various personalities that can be found at a fiery night of drugs, alcohol and human attraction and sensual passion. It reminded me of the idea of how certain spaces can expose people to ‘freaks of nature’. From reading Salles’s interpretation, I felt as if the piece asserts that anyone is capable of being a ‘freak of nature’ and being normal simply did not exist. Vehicles like social media platforms or dating apps prove how all the freaks come out to play, but Salles asks questions such as, what is identity? How do we class people? It’s an intoxicating way to question social norms, segregation and categories like ‘the other’. The finale piece, Jasmin Vardimon’s (in between) was felt as an emotional effigy to nature and earth. 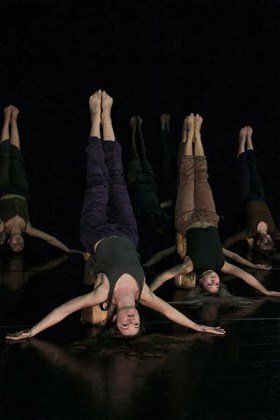 First created for the National Youth Dance Company in 2013, JV2 showed a different sight, pulling away from people, and devoting focus on our natural world. Symmetrical and engaging, JV2 balanced themselves on, what looked like, stumps from trees with their heads to the ground and legs and feet pointing to the sky. They waved their arms gently and soothingly with smiles on their faces. Yet, abruptly, their serenity is destroyed as Daniel Brown and Dominic Coffey enter as unaffected tree cutters. They ruthlessly cut away at these beautiful flowing producers of oxygen, however, there is something alluring that draws Coffey’s character to Jordan Harapiak’s natural form that he tries to put her back to life every time Brown relentless tries to cut her down. Katerina Christoforou also provides a symbolic and influential component to the piece acting as an authoritative force of nature, communicating through heavy breathing and shifting the dancers left to right, to jump high in the air and throw themselves onto the ground in complete synchronisation. By the end of it, the studio had warmed up as JV2 rapidly made gorgeous patterns with their strong, robust and athletic bodies. They tired themselves out but transformed the evening to a splendorous conclusion. JV2 2016 features the work of Jasmin Vardimon herself and that of current Jasmin Vardimon Company members Esteban Fourmi and Aoi Nakamura (with their company AΦE) and former company member Vinicius Salles. Vardimon’s work (in between) was first created for the National Youth Dance Company in 2013 and premiered at Sadlers Wells. Trapped in flux between the force of the group and the power of the individual, the work echoes relationships between humans and the natural environment. Ashford-based AΦE presents a work that questions the notion of presence and the realms of studio to performance and Vinicius Salles offers an inquiry of social judgments, acceptance of differences, and superficial assumptions of the “other”. Jasmin Vardimon says: “I am delighted to have two shows presented at two major London theatre’s within the space of a week. This display the breadth of work that the company produces and the activities we undertake above and beyond our core productions. Tannhäuser presents the company work alongside the ROH orchestra and some of the world’s finest opera talents. Through JV2 we support emerging artists in their first steps in the professional world. I’m very proud of their achievements and thrilled about both runs”. I watched the performance Saturday at 2.30, has my daughter was performing and I was blown away by the talent and show itself…..Thankyou for such an enjoyable day.